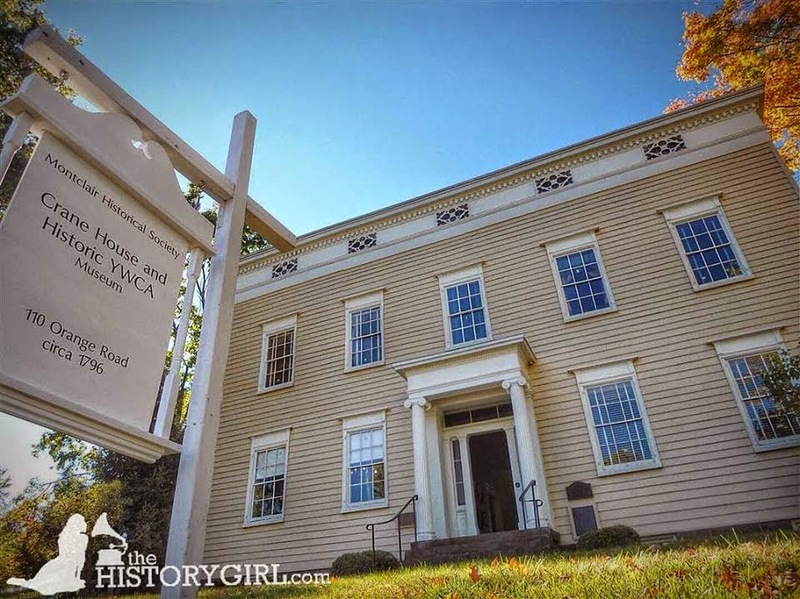 NJ Weekend Historical Happenings: 2/21/15 - 2/22/15 ~ The History Girl! Join the Friends of the World War II Lookout Tower on Saturday at 12:00 noon for a guided tour of the Forgotten Warriors Vietnam Museum on Forrestal Road at the Cape May Airport, Erma (Lower Township), NJ. Museum staff will give a tour of the museum, weather permitting. Rain/snow date is Saturday, February 28. Parking is available at the airport and admission is free. Adults are asked to bring a young person with them so the group can advance one of its primary goals, which is developing in the younger generation an understanding and appreciation of not only Cape May's important role in World War II, but of the traits of patriotism, loyalty, and self-sacrifice so characteristic of the people of these war years. The World War II Lookout Tower (Fire Control Tower No. 23), located on Sunset Boulevard, was used for spotting enemy ships during World War II and aiming guns for nearby coastal artillery fortifications. MAC restored the tower in 2008-09 and opened it to the public in April, 2009. Family members can honor loved ones through memorial plaques mounted permanently at the site. An All Veterans Memorial was dedicated at the Tower on May 19, 2012 and is open throughout the year for quiet contemplation. Sponsored by the Friends of the World War II Tower, an affinity group of the Mid-Atlantic Center for the Arts & Humanities (MAC). MAC is a multifaceted not-for-profit organization committed to promoting the preservation, interpretation, and cultural enrichment of the Cape May region for its residents and visitors. For information about MAC's year-round schedule of tours, festivals, and special events call 609-884-5404 or 800-275-4278, or visit www.capemaymac.org. 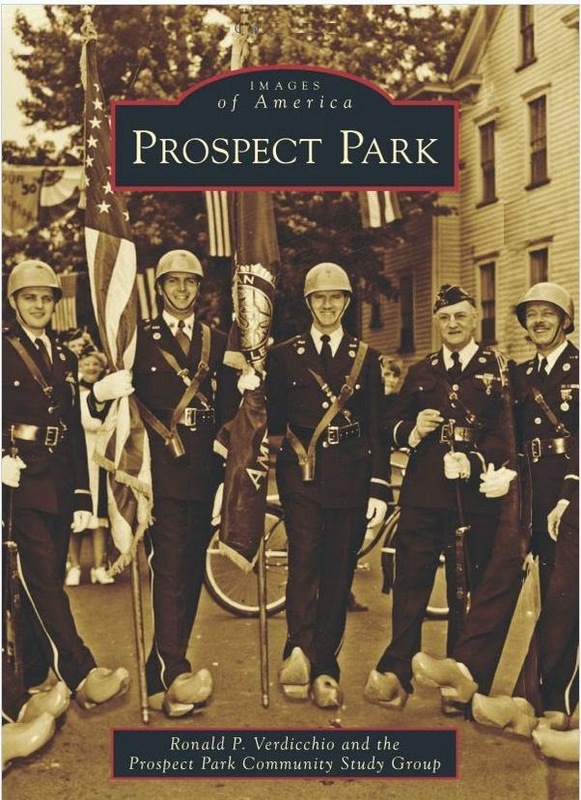 On Saturday, at 2:00 pm in Lambert Castle, the Passaic County Historical Society will welcome the authors of Images of America: Prospect Park. Join us and listen to some of the interesting and unexpected stories they unearthed in their research. This publication includes several images from the Historical Society's own collections. After the presentation, the authors will sign books, and books will also be available at the museum on the day of the presentation. This presentation is open to the public, and general admission to the museum applies. In the case of inclement weather a snow day has been scheduled (February 28). Check our website for the most up-to-date information. Lambert Castle, home of the Passaic County Historical Society, is located at 3 Valley Road, Paterson NJ. For more information, call 973-247-0085 or visit www.lambertcastle.org. Join the Jersey City & Harsimus Cemetery in Celebrating Black History Month at a special tribute to the Civil War U.S. Colored Troops at the Historic Jersey City and Harsimus Cemetery on Saturday at 1:00 pm. Honored guests include "U.S.C.T. New York Regiment United States Colored Troops Reenactors - 20th, 26th, 31st" and "Che Nautical Edutainment". See actual Civil War artifacts and a film and discussion. Donation suggested. The Jersey City & Harsimus Cemetery is located at 435 Newark Avenue, Jersey City, NJ. For more information, call 201-707-0738 or 973-204-9888 or visit www.jerseycitycemetery.org. The Montclair Historical Society is so excited for the upcoming launch of "In the Spirit of Freedom," an exhibition of contemporary quilts by the Nubian Heritage Quilters Guild at the Montclair Historical Society on Saturday. The Guild is celebrating 20 years of wonderful quilt-making and community engagement and showcases its latest work every two years at the historical society. This show comes wonderfully following the launch of the YWCA exhibition and in the wake of the spectacular quilt exhibition at the Montclair Art Museum. Quilters, art lovers, anyone interested in local crafts and folk art, as well as those of us who continue to love and support African American art and culture will be sure to love this exhibition. The Nubian Quilters Guild is a local treasure and the historical society always looks forward to this biennial showcase. The exhibition will be on display from Saturday, February 21 - March 1, 2015 and available for viewing on Sundays from 1:00 - 4:00 pm at the Crane House, 106 Orange Road, Montclair, NJ. For more information, call 973-744-1796, e-mail mail@montclairhistorical.org, or visit www.montclairhistorical.org. What was it like during the ‘Hard Winter’? How did the encampment work? Join Reenactors at the Wick House on Saturday and Sunday as they turn the home into a military headquarters. Bring the family to discover what officers, soldiers, and civilians roles were during the Jockey Hollow Encampment. 10:00 - 11:00 am - Civilian Life: What did regular citizens think about the Continental Army in their backyard? What were some of the sacrifices they gave for the Patriot cause? Did everyone in and around Morristown believe in the patriot cause? Find out for yourself when you explore the Wick House in Jockey Hollow. 11:00 am - 12:00 noon - Officers Life and Duties: What did George Washington expect from his officers in the Jockey Hollow Encampment? What did they expect from the common soldiers under their command? What was like for them in camp? Ask a Continental Officer this and more at the Wick House in Jockey Hollow. 12:00 noon - 1:00 pm - Soldiers Life and Duties: What was daily life like for soldiers throughout Jockey Hollow during the 'Hard WInter'? What did they do on a daily basis? What did they think of the Patriot cause? Join a Continental Soldier at the Wick House and discover what life was like at the Wick House in Jockey Hollow. 1:00 - 2:00 pm - Feeding the Army: What did soldiers eat during the American Revolution? Did they really eat tree bark and shoes in Jockey Hollow? Join Reenactors around the camp fire outside the Wick House and discover some of the foods that soldiers ate during the American Revolution. 2:00 - 4:00 pm - On Patrol with the Continental Army: What was the importance of patrols and outpost duty to the rest of the Army encamped on Jockey Hollow. Join Reenactors as they go on a 'patrol' through Jockey Hollow and discover what it was like to to leave the comfort of the Huts and safety of camp. This hike will be no more than 2 miles roundtrip. Meet at the Wick House in Jockey Hollow. All events take place in the Wick House at Jockey Hollow, within Morristown National Historical Park, Morristown, NJ. Cost: Free. For more information, call 973-543-4030 or visit www.nps.gov/morr. George Washington's birthday is coming, and he doesn't look a day over 51! At least his life-size mannequin at Rockingham doesn't. Come see for yourself during Rockingham Historic Site's annual George Washington birthday celebration on Saturday. You can learn about our first president's life, tour his last wartime headquarters, and enjoy refreshments. The tours, which will emphasize details of Washington's life instead of the regular history tour of the house, will be offered between 11:00 am and 4:00 pm (last tour at 3:30 pm) with refreshments served after each tour. Tour size is limited and reservations are required. A donation of $5 is suggested. Please call 609-683-7132 for reservations. Washington, commander in chief for the Continental Army during the American Revolution, stayed at Rockingham from late August to early November in 1783. It became his final wartime headquarters when the Treaty of Paris was formally signed while he resided there. America's founding couple, George and Martha Washington, will return to Morristown, NJ, 235 years after they spent the hard winter of 1779-1780 at the Theodosia Ford mansion. Re-enactors portraying George and Martha Washington will reminisce about that challenging time in American history during a presentation Sunday from 3:00 - 4:00 pm at the Morristown National Historic Park Museum Auditorium, 30 Washington Place, Morristown, NJ. The free program, hosted by the Morristown National Historic Park (NHP) in cooperation with the Jacobus Vanderveer House & Museum in Bedminster, is funded by a grant from The Ann L. and George H. Clapp Charitable and Educational Trust. George and Martha Washington will give attendees a first-hand account of the anxieties associated with the discomforts of that winter, as well as their much larger, shared task of keeping the spirits of the American ideal from falling victim to a winter which nearly stopped the Army in its tracks. The program is free of charge, but registration is suggested. Register online at: www.jvanderveerhouse.org. For more information about Morristown National Historical Park, call 973-539-2016 ext. 210 or visit www.nps.gov/morr. A Country Ball upon the Anniversary of Washington's Birthday will be held at Historic New Bridge Landing on Sunday from 1:00 - 5:00 pm. Eighteenth century dancing will take place in the Steuben House at 1:30, 2:45, and 4:00 pm under the direction of Denise Piccino with Ridley & Anne Enslow providing musical accompaniment on fiddle and hammered dulcimer. Throughout the afternoon, Rodger Yaden will portray General George Washington. Hot cider and crullers will be served in the restored 18th-century tavern in the Campbell-Christie House, where the gift shop is also located. Visitors may also see open-hearth cooking demonstrated in the out-kitchen. A tiger-stripe maple bedstead, reputedly used in a local home where George Washington stayed during the 1780 Steenrapie Encampment, is currently on display. The Demarest house will feature a spinning demonstration and tours. The 3rd NJ and Outwater’s Militia will be on-hand to provide military demonstrations. Historic New Bridge Landing is located at 1201-1209 Main Street, River Edge, NJ. Admission by donation: $7 for adults, $5 for children, and free for Bergen County Historical Society members. For more information, visit www.bergencountyhistory.org. A selection of inspiring African-American readings, music, and art will highlight the Kenilworth Historical Society's Black History Month Celebration on Sunday. The general public is invited to attend the event, which will take place at the newly restored Oswald J. Nitschke House "living history" museum and cultural arts center, 49 South 21 Street, Kenilworth, N.J. The celebration, which is appropriate for all age groups, will begin at 1:30 pm. Refreshments will be served. Admission is free, but advance registration is requested. Please call 908-709-0434 to register. The event will feature an African-American "Read-In" conducted by local David Brearley Middle and High School students, who will present a selection of inspirational poetry by various Black authors. Members of the community, including a number of local churches, will also participate in the Read-In. Additionally highlighting the celebration will be a performance of African-American spirituals sung by professional vocalists and Kenilworth residents Kerry and Betsy Stubbs, together with their children Melody and Orion, who also are experienced performers. In addition to bringing their musical talent to an extensive range of venues and audiences throughout the year, Kerry and Betsy Stubbs are employed as teachers - Kerry, as a music instructor for the Elizabeth Public School System and Betsy, as a voice instructor for Kean University and Caldwell University. The Stubbs Family Singers have been performing together for several years and specialize in "a cappella" singing. Their repertoire of spirituals celebrates the African-American contribution to American music. During the event, participants will have the opportunity to view an exhibition of inspiring original prints that were created by South African artists who participated in an art exchange program with students from David Brearley Middle and High School under the direction of local art instructor Janice Marsili. The artwork reflects the underlying value of art in bringing about social change and in promoting cross-cultural communications. For more information, call 908-709-0434 or visit www.kenilworthhistoricalsociety.org. Come celebrate George Washington’s 283rd birthday on Sunday, February 22, 2015 from 10:00 am - 2:00 pm at Washington Crossing Historic Park in Pennsylvania. Admission is $1. During the day, buildings in the historic village will be open with demonstrations taking place in the blacksmith shop, a 17th-century birthday cake demonstration in the Hibbs House, Colonial dress-up in the Frye House, and more. Every child will receive materials to make a special birthday postcard for General Washington, who will arrive at the park at 1:00 pm. Soon after his arrival, visitors will sing Happy Birthday to him and enjoy cake that he will cut with his sword. Washington Crossing Park is located at the intersection of Routes 32 and 532 in Washington Crossing, Pennsylvania. This event is sponsored by the Friends of Washington Crossing Park in partnership with the Pennsylvania Historical and Museum Commission. For more information, call 215-493-4076 or visit www.washingtoncrossingpark.org. On Sunday from 2:00 - 5:00 pm, the Caldwell Parsonage in Union Township, NJ will be open for guided tours. The museum, once the residence of Rev. James and Mrs. Hannah Caldwell, is listed on both the National and State Registers of Historic Places. Lore Ullrich and Anita Centeno will serve as docents. Admission is free. The Caldwell Parsonage is located at 909 Caldwell Avenue, Union Township, NJ. For more information, call Barbara at 908-687-0048 or visit www.uniontwphistoricalsociety.webs.com. Step back through over 200 years of American history at Montclair's historic properties at 108 Orange Road. Visit the newly reinterpreted Crane House to reflect the YWCA period from 1920 - 1965, check out the farm, and meet the chickens. The site is open from 1:00 - 4:00 pm. Free-will donation. Free admission for members! The Shultz House (Evergreens) will be closed for the season, reopening Spring 2015. For more information, call 973-744-1796, e-mail mail@montclairhistorical.org, or visit www.montclairhistorical.org. On Sunday at 4:00 pm, the Westfield Historical Society will show an hour-long presentation on two current political leaders who are helping shape our society. Experience with them through their genealogical journey to better understand their activist roots, the realization why they are drawn into this country's political quagmire, and how their current roles in politics may be rooted in not only their desire for political justice for all people, but also may hinge on their genealogical past. This Black History program is free and open to the public. Light refreshments will be served after the presentation which will be shown at the Reeve History & Cultural Resource Center, 314 Mountain Avenue Westfield, NJ. Space is limited so please call 908-654-1794 to reserve your place today. For more information, visit http://westfieldhistoricalsociety.artisteer.net. Would you like to see a real, live golden eagle, a peregrine falcon or, perhaps, a saw-whet owl? 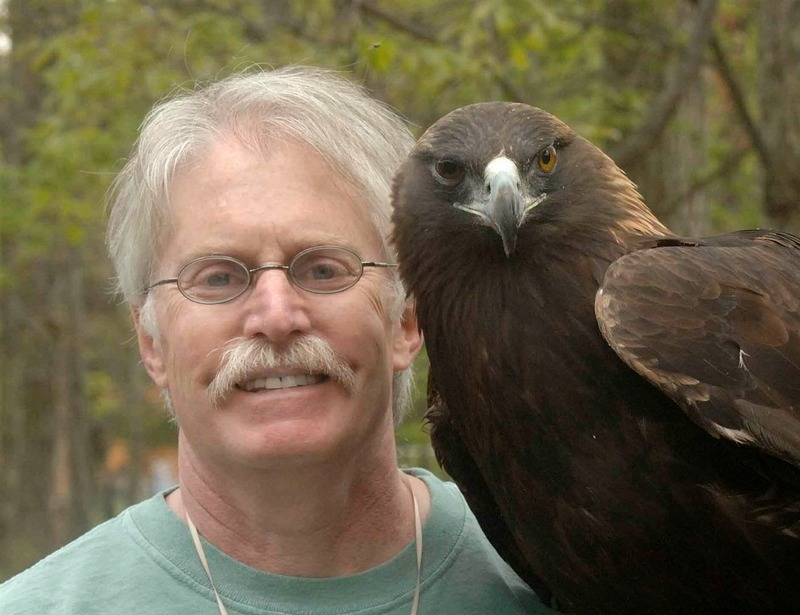 If so, join Durand-Hedden House & Garden on Sunday at 1:30 pm as Bill Streeter, director of the Delaware Valley Raptor Center of Milford, Pennsylvania, presents Close Encounters with Birds of Prey. You’ll view six live raptors and spend a magical hour gaining a greater knowledge and appreciation of the remarkable raptors of the northeast, a number of which visit the yards and open spaces right here in Maplewood. Streeter, who has a BA in biology and an MS in zoology, will entertain, as well as educate, with the knowledge he has gained through over 30 years of studying and rehabilitating raptors, and through practicing the ancient art of falconry. The lecture portion of the program will take place in the Jefferson School auditorium (518 Ridgewood Road, Maplewood, NJ) directly across the street from the Durand-Hedden House (523 Ridgewood Road). The side door on the Virginia Road side of the School will open at 1:00 and the talk will begin at 1:30 p.m. Afterwards, light refreshments will be served at the Durand-Hedden House. The Country Store will be open until 5:00 pm continuing to offer hard-to-find books, toys, and posters that people have come to love, as well as some exciting new items. On Sunday, February 22, the Store will feature photos of birds of prey by Maplewood artist Joy Yagid. An award-winning photographer, Yagid has been capturing images of the resident raptors at The Raptor Trust in Millington, New Jersey, for the last seven years. She hopes viewers will come away with a greater respect for raptors and the natural world we all inhabit. The event is free. Donations are appreciated. For more information, call 973-763-7712 or visit www.durandhedden.org. On Sunday, the Lawrence Historical Society will hold its annual meeting in the Lawrence High School Community Commons at 3:00 pm. Township Historian Dennis Waters will present a program on "The Timeline of Lawrence History: 300 Years in 60 Images." In October 2014, the Lawrence Historical Society installed a timeline showing 300 years of Lawrence history in the Township Municipal Building. The timeline comprises 60 images highlighting important events in Lawrence history from 1687-1990. Waters will lead his audience for an imaginary walk along the timeline, stopping briefly to discuss each image, filling in many fascinating details and providing important context and background. His talk will conclude the annual meeting of the Lawrence Historical Society, which will also feature a cake marking the 318th birthday of Lawrence, founded as Maidenhead in 1697. For more information, visit www.thelhs.org. It’s time to celebrate the birthday of our first president! The Miller-Cory House Museum’s program on Sunday from 2:00 - 4:00 pm will feature facts (what exactly were his teeth made of? ), fiction (did he really cut down that cherry tree? ), portraits of his life, and other information. A simple children’s craft and limited tours of the museum are also included. Admission: $7 per adult; $4 children ages 6 to 12; free for children age 5 and under. Tickets are sold at Bainbridge House, 158 Nassau Street, Princeton, NJ justifying at 12:00 noon. Tour begins at 2:00 pm and ends at 4:00 pm. Space is limited. For more information, call 609-921-6748 or visit www.princetonhistory.org. On Sunday at the Crane-Phillips House Museum, former local resident, James Gigantino will discuss his book, The Ragged Road to Abolition: Slavery and Freedom in New Jersey, 1775-1865 from 2:00 - 4:00pm. The program begins at 2:15 pm. A Cranford High School graduate, James J. Gigantino II is an Assistant Professor of History at the University of Arkansas. He is a historian who specializes in the history of slavery. 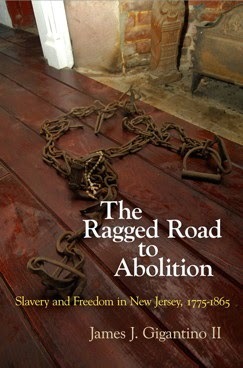 His book, The Ragged Road to Abolition: Slavery and Freedom in New Jersey, 1775-1865 focuses on how, contrary to popular perception, slavery persisted in the North well into the 19th century. This was especially the case in New Jersey, the last northern state to pass an abolition statute, in 1804. Because of the nature of the law, which freed children born to enslaved mothers only after they had served their mother's master for more than two decades, slavery continued in New Jersey through the Civil War. This realization shatters the perceived easy dichotomies between free states and slave states at the onset of the Civil War as well as challenges our understanding of the impact of the American Revolution on the North. Gigantino is also the editor of the forthcoming The American Revolution in New Jersey: The Battlefront meets the Home Front (Rutgers University Press, April 2015) and is currently researching a new book, William Livingston's American Revolution, which uses the life and experiences of William Livingston, New Jersey's first governor, to explore how ordinary Americans experienced the Revolution. Admission is free. To reserve your seat, call the historical society's office at 908-276-0082 or email cranfordhistoricalsociety@verizon.net. Established in 1927, the Cranford Historical Society, a nonprofit organization, has been dedicated to the preservation and perpetuation of Cranford's history. For more information, visit www.cranfordhistoricalsociety.com. This spring Macculloch Hall Historical Museum (MHHM) presents a series of programs related to the current exhibits on display at the museum. Speakers will give presentations on the last Sunday of the month, February through June, at 4:30 pm in the main gallery. The series begins on Sunday when MHHM F.M Kirby Curator of Collections Ryan Hyman presents "The Work of Thomas Nast." 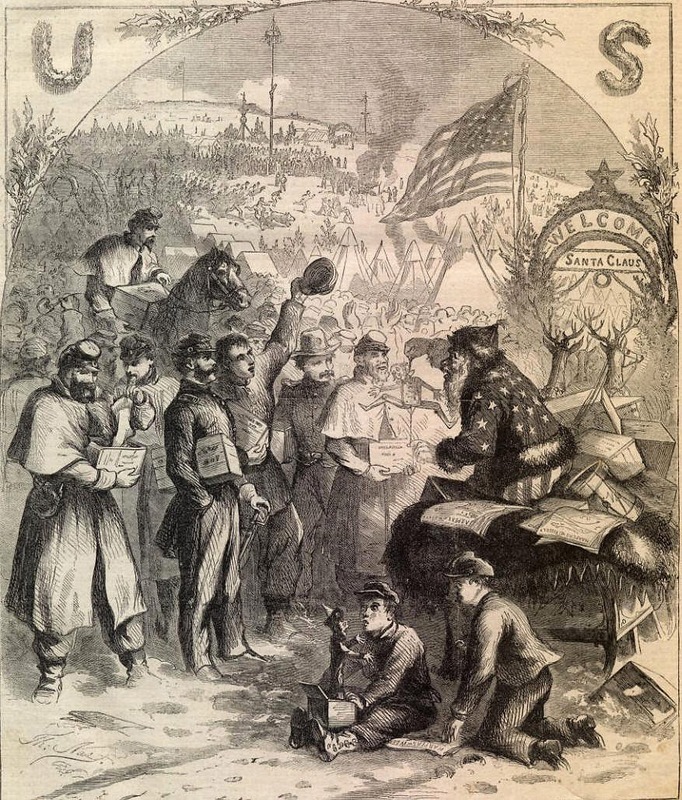 During this presentation on the nineteenth century political cartoonist Thomas Nast (1840-1902), Ryan will highlight Nast's most popular political cartoons and a few interesting but lesser known images. Topics will include Nast's work on some of America's most popular icons: Santa Claus, Uncle Sam, the Democratic Donkey and the Republican Elephant. Ryan will also discuss some of the previously unpublished works, including paintings, rarely seen pencil sketches, pen and ink drawings, many of which are currently on display in the current main gallery exhibition, "Thomas Nast: Unknown Works and American Icons." Ryan will also share some of Nast's political cartoon work about the Civil War, which is currently on display in the "The Civil War Through the Eyes of Thomas Nast" exhibit. Nast's battlefront and home front images drawn during the Civil War were powerful tools for bringing the war into people's homes. Tickets for the program go on sale beginning at 1:00 pm on the day of the program (no advance sales) and remain on sale until the presentation begins at 4:30 pm. Speaker tickets include admission to the museum exhibits during the afternoon and a guided tour of period rooms. The last tour ticket is sold at 3:00 pm. The museum's collection of "Currier & Ives" prints are on display throughout the museum and the second floor "The Civil War Through the Eyes of Thomas Nast" and "Canals of New Jersey" (opens March 15th) exhibits will remain on view until 4:30 pm. The "Thomas Nast: Unknown Works and American Icons" exhibit will close at 3:30 pm in preparation for the program. Tickets are Adults $8; Seniors & Students $6; Children 6 - 12 $4. Members and children under 5 are admitted free. Macculloch Hall is located at 45 MacCulloch Avenue, Morristown, NJ. For more information, call 973-538-2404 or visit www.maccullochhall.org. The Trent House Association and The Trenton Historical Society present "The Story of Governor Lewis Morris (1671 - 1746), prominent Trent House resident," with archival historian, Rick Geffken at 2 p.m. at the William Trent House, Visitor Center, 15 Market Street, Trenton, NJ. Admission is $15 and $10 for members of the Trent House Association or the Trenton Historical Society Tickets sold at the door. In addition to the wealthy merchant who built it, the elegant residence known today as the William Trent House has housed a number of prominent New Jersey citizens including the first Colonial Governor, Lewis Morris. 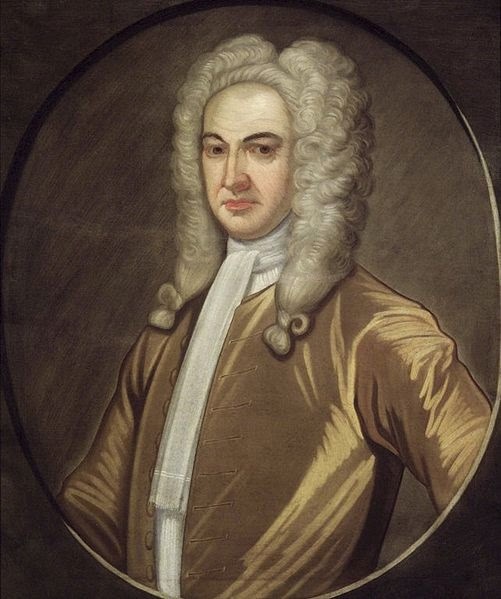 Governor Lewis Morris, one of several prominent New Jersey Morrises, distinguished himself in many ways, not the least of which was as NJ's first Colonial Governor from 1738, when the administration of New Jersey was separated from that of New York, until his death in 1746. Unlike the "universally beloved" Trent, Morris engendered such bitterness and acrimony during his tenure as governor and was so roundly disliked by factions within the New Jersey legislature that they refused to pay him. Prior to moving to Trenton, Morris lived at Morrisania in the Bronx and is buried near his Bronx home. He rented the Trent House (then called Bloomsbury Court) from Pennsylvania governor George Thomas. As a provision of renting the house, Morris had Thomas build a kitchen addition in 1742. The addition is currently being excavated. Rick Geffken, an archival historian retired from careers in the computer industry and teaching, has conducted extensive research on Governor Lewis Morris and his New Jersey landholdings. He is a member of the Farmingdale and Shrewsbury Historical Societies, as well as the Monmouth County Historical Association. Geffken publishes The Monmouth Connection, the newsletter of the Monmouth County Genealogy Society. Geffken has spoken at many local and statewide historical and preservation conferences. He is currently researching and writing a book on Shrewsbury. For more information, call 609-989-3027 or visit www.williamtrenthouse.org. On Sunday from 2:00 - 6:00 pm, the Washington Crossing Park Association, Inc. will hold a symposium entitled "After the Crossing: New Jersey in the American Revolution” to celebrate George Washington’s birthday. The program will be held at the Union Fire House on River Road in Titusville, NJ. The three-part lecture series and commentary will focus on New Jersey’s role during the American Revolution beginning with Washington’s famous crossing and exploring the Battle of Monmouth and War in the Watchungs. 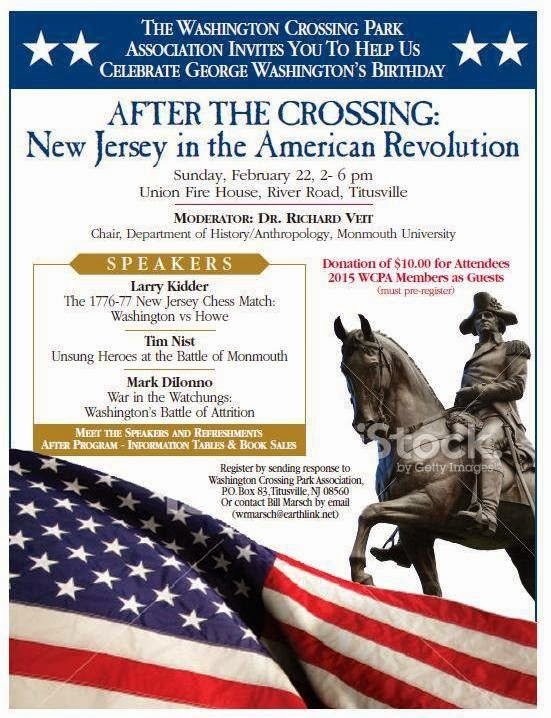 Featured speakers include historians Larry Kidder, Tim Nist and Mark DiIonno with Dr. Richard Veit, Department Chair of History at Monmouth University serving as moderator. Also in attendance will be George Washington himself, portrayed by well-known re-enactor Sam Davis. General Washington will add personal perspective to the speakers’ lectures and he will include his thoughts on the importance of the New Jersey in the American Revolution. The afternoon talks will be followed by commentary and questions from the audience. The event will include book sales from the historians present and information tables. Refreshments will be served. Pre-register for the event by contacting Bill Marsch at wrmarsch@earthlink.net, or attendees may register the day of the program. $10 donation is requested; members of the WCPA are free but must register. 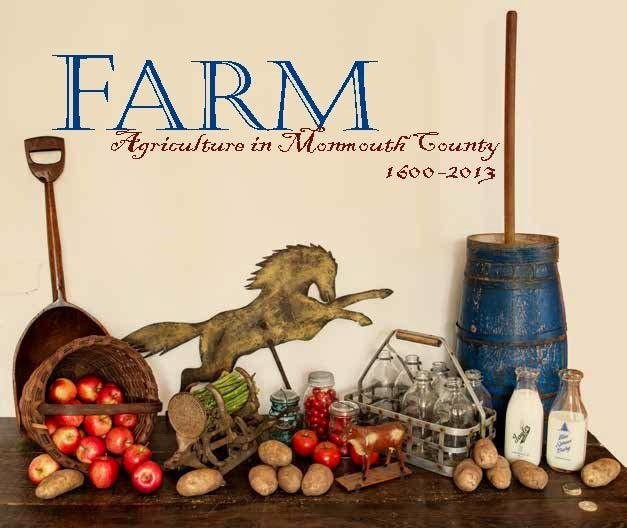 Monmouth County Historical Association's newest exhibition, "Farm: Agriculture in Monmouth County 1600-2013," is open to the public at the museum in Freehold and will be on display through December 31, 2014 February 28, 2015. The history of agriculture and farming in Monmouth County has long roots deep in the past, as does New Jersey itself, from earliest days of pre-European settlement, when Lenape Indians harvested corn, squash, and beans to the modern reintroduction of organic agricultural practices. The Monmouth County Historical Association's museum is located at 70 Court Street, Freehold NJ. Regular admission to the museum is $5.00 and $2.50 for students and seniors. Admission is free for members. Museum hours are Tuesday - Saturday, 10:00 am - 4:00 pm. For more information, call 732-462-1466 or visit www.monmouthhistory.org. The Trenton City Museum transports you to a time when apron strings tied the lives of the people of Trenton. "Ties that Bind: The Aprons of Trenton" runs from November 1, 2014 through March 1, 2014. The exhibit features aprons associated with church picnics, classroom art projects, the industrial workers who kept the city in business, and the homemakers who made holiday meals and memories for generations. The Trenton City Museum, Ellarslie, is located in Cadwalader Park, Trenton, NJ. For more information, call 609-989-3632 or visit www.ellarslie.org. The Trenton Museum Society celebrates the soon-to-be-demolished building in an exhibit at the Trenton City Museum at Ellarslie through Sunday, March 1, 2015. The former high school building, opened in 1932, was an iconic structure that inspired and nurtured thousands of Trenton students over the past 82 years. The Trenton Museum Society invites graduates, teachers and administrators from the school, historic preservationists, and those interested in Trenton's history to attend the exhibit. The Trenton City Museum, Ellarslie, is located in Cadwalader Park, Trenton, NJ. For more information, call 609-989-3632 or visit www.ellarslie.org. A new exhibit entitled A Closer Look at our Community: The Fine Art of Mark Oberndorf is open through March 29, 2015 in Lambert Castle (home of the Passaic County Historical Society) at 3 Valley Road, Paterson, NJ. This exhibit focuses on the sights of our local community, as shown in the paintings of Bergen County resident and artist Mark Oberndorf. Oberndorf’s work focuses on the views of local buildings and features within our neighborhoods. Many pieces included in A Closer Look at our Community feature Passaic County, while others portray subjects from a wider geographic area. Some subjects include restaurant signs, barber shops, private homes, and fire stations. Through his work, Oberndorf demonstrates what is beautiful, interesting and quirky in our communities. Through this exhibition visitors will be able to see their environment in a different perspective. Visitors can access the exhibition during regular museum hours (Wednesday - Sunday). General museum admissions apply. Meet the artist at the exhibit reception held at Lambert Castle on Wednesday January 14, 2015 from 7:00 - 9:00 pm. The reception is free for members; for all others regular admission applies. For more information, call 973-247-0085 or visit www.lambertcastle.org. On Saturday, the American Labor Museum/Botto House National Landmark located in Haledon, NJ proudly opens the exhibit entitled, "New Haven's Garment Workers: An Elm City Story" on loan from the Greater New Haven Labor History Association. Through historic photographs and artifacts, "New Haven's Garment Workers: An Elm City Story" presents a vivid portrait of the lives, victories, struggles and sacrifices of a courageous group of working people in the clothing industry in New Haven, Connecticut. In 1932 and 1933, to combat sweatshop conditions in the clothing industry, workers undertook a large-scale unionization of the industry that resulted in improvements in wages, working conditions, and hours. "Their history offers important lessons for all of us in these times," notes Joan Cavanaugh, Ph.D., the exhibit's creator. The exhibit will be on view through April 17, 2015. The American Labor Museum is headquartered in the historic Botto House National Landmark, located at 83 Norwood Street, Haledon, NJ. It was the meeting place for over 20,000 silk mill workers during the 1913 Paterson Silk Strike. The Museum offers a free lending library, restored period rooms, changing exhibits, Museum Store, Old World Gardens, educational programs and special events. The museum's hours of operation are Monday through Friday 9:00 am - 5:00 pm. Tours are offered Wednesday through Saturday from 1:00 - 4:00 pm or by appointment. For more information, call 973-595-7953, visit www.labormuseum.net, or e-mail labormuseum@aol.com. The Ocean County Historical Society, invites you to view their new exhibit entitled, "Hook, Line and Sinker: History of Fishing in Ocean County up to 1950", which features the collections of members Richard Updike and Ferd Klebold. The exhibit takes visitors back to the days of pound fishing, frost fishing, clamming, eeling, and whaling with photos and artifacts used in the fishing industry along the Jersey Coast. A hand-forged clam rake, the white oak eel pot that used horseshoe crabs for bait, a whale vertebra found in the surf in Ocean County, early reels, and photos galore of fishermen and their catches are just some of the treasures you will find in this exhibit. Winter or summer, Ocean County fishermen braved the elements to harvest nature's bounty from the Atlantic Ocean, Barnegat Bay, and numerous rivers. Visit OCHS Tuesday through Friday, 10:00 am - 3:30 pm and the first Saturday of each month from 1:00 - 4:00 pm. The Ocean County Historical Society is located at 26 Hadley Avenue, Toms River, NJ. For more information, visit www.oceancountyhistory.org or call 732-341-1880. From a ship's horn manufactured by Leslie Company to photos of steel and heat-treating plant Benedict-Miller, Inc., the Lyndhurst Historical Society is showcasing just a sampling of the many businesses that contributed to the community and beyond in its latest exhibit, "Lyndhurst Business: Building a Community," which runs from now until August 2015. "It's New Jersey's 350th birthday and, in addition to celebrating the state as a whole, we wanted to give a nod to our local community," said Doris Bergquist, who, along with members Dale Jankowski and Doris Ludwig, curated the exhibit. "There have been and continue to be many highly regarded businesses in Lyndhurst. The Leslie Company, for example, was once in Lyndhurst and built one of the horns used on the Queen Mary." The exhibit is free and open to the public, though a small donation to the society would be appreciated. The Little Red Schoolhouse Museum, located at 400 RIverside Avenue, Lyndhurst, NJ is open on the second and fourth Sundays of every month from 2:00 - 4:00 pm. For more information, call 201-804-2513 or visit www.lyndhursthistoricalsociety.org.